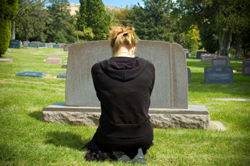 Tammy writes in: My friend who is 52 is grieving over a baby she lost when she was 17. She has two other children- adults now. But she is suddenly feeling this loss feeling like she was supposed to have three children. Is it possible to grieve this far from the death? Tom Zuba, author, inspirational speaker, and workshop facilitator, responds: Yes, it is possible to grieve many years after a death has occurred. Many of us think, and probably secretly hope, that grief has a limited shelf life. I don’t believe that’s true. It certainly hasn’t been my experience. I think we’ll always be grieving the great losses of our life and the death of your friend’s baby when she was only 17 is certainly a great loss. Often the grief changes though. For many, it softens and the underlying love we feel for the person who has died rises to the surface quicker. The pain is not as intense nor does it last as long as it once did. But I think we will always experience moments of grief. It’s one of the ways we stay connected. I believe that the relationship we have with a loved one, and certainly with our children, continues even after they die. It’s up to us to determine if that relationship will be healthy or unhealthy. I’d like to suggest to you that your friend does indeed still have three children. One happened to die as a baby. But your friend is still that child’s mother. Nothing can change that. Now that her other two children have grown and are perhaps out of the house, there may be some space available for the grief that is rooted in the baby’s death to rise up. It sounds like that may be happening. It’s healthy and brings with it great opportunity for growth. I hope you will accompany your friend as she feels every feeling and emotion that rises to the surface – emotions and feelings that may have been stuffed deep for a long time. Perhaps you can encourage her to examine and maybe even redefine the relationship she has with her child that died. Does she have a picture of that baby displayed in a special place in her home? Does she honor her baby’s birth in a unique way? She might consider writing a letter to the baby. What would she like this baby to know? Or she might find comfort in writing a letter to herself from the baby. If the baby could talk to her mom, all these years later, what would the baby say? If your friend celebrates Christmas, she could buy a special ornament this year in memory of her baby. This could become her annual tradition. The relationship continues. It’s worth taking the time to make sure it’s a healthy one. I just have to say, you’re dreamy. You always have such great advice and appreciation for where people are in the grieving process. Thank you! I think I would have to agree. There is no shelf life on grief. I had four children, Greg 1979, Mike 1981, Renee 1986 and Matthew in 1990. Renee was the baby that died of Anacephali. Greg was seven, Mike was five. I remember Greg said; you were pregnent all that time and all we got was a dead baby. Mike was so young he understood what a five year old could. My husband and I divorced eight years ago. Mike was 20 years old and he finally wrote Renee a letter and left at her grave. I did not intrude on his thoughts and open it.